THE covered vehicle transporter, developed by professionals for professionals with a strong chassis and upgraded axles. 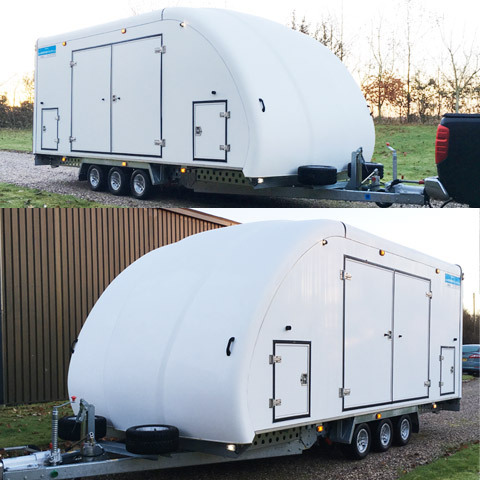 The Woodford Galaxy trailer, available from Marsden Barn Trailers Ltd is a Tri axle tilt bed transporter fitted with double external and internal LED lighting. The front and rear hatches give quick and easy access to the lashing points at both ends of the vehicle being transported. The 2.5m wide doors on each side give improved internal access. A very low loading angle is provided by the tilt bed and huge ramp (which can be further enhanced by the aluminium assistor ramps that come as standard with the Galaxy). This allows vehicles with the lowest of ground clearances to be loaded safely. The payload limit is 2110kg and the gross weight (load plus vehicle carried) is 3500kg. 7’ or 7’8” width options. The payload limit is 2050kg and the gross (load plus vehicle carried) is 3500kg. 7’ or 7’8” width options.